Day 2 and so far so good! I am waiting for my delivery of food to arrive from the coop..I wonder what I ordered? Lunch today was flatbread pizza. I love the idea of flatbread – simple to make with only a few ingredients (essentially flour and water) and ready to eat in less than an hour. In a previous life (say last week), I would have thought an hour was a long time to wait for a piece of bread…but compared to 3 or 4 hours, it’s looking good! 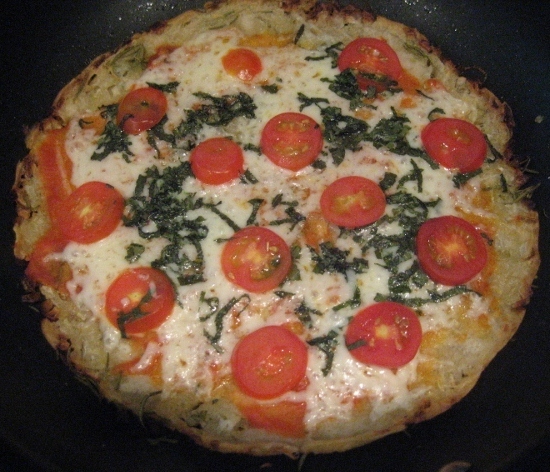 To make the pizza, I just topped the finished flatbread with grated mozzarella, tomatoes, and basil (all local) and baked a little longer.